OK, I am going to make my first post in months. I have been thinking a lot lately about the the top third basemen in Tigers history. It's an interesting topic because it is their weakest position historically with no elite players at the position for any length of time. There is no long-term superstar such as Ty Cobb or Charlie Gehringer or Alan Trammell or anybody like that. 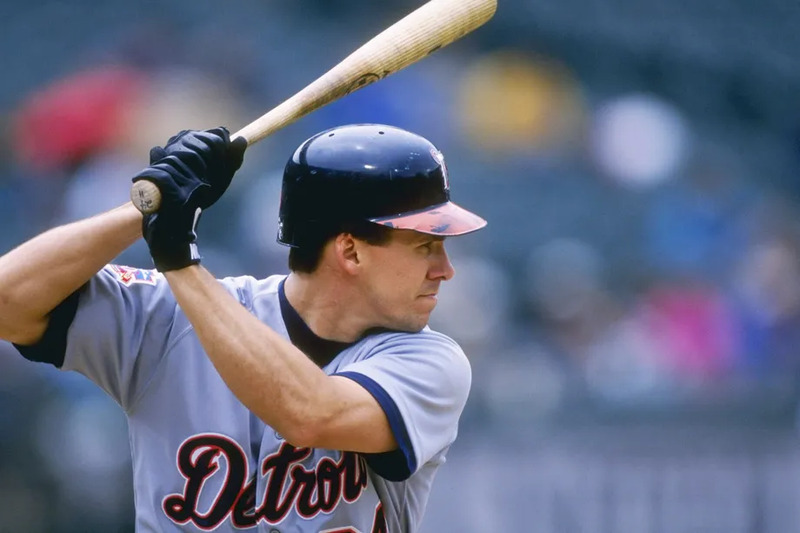 So, who was the best Tigers third baseman ever? We could make it easy if we included current slugger Miguel Cabrera. He has by far the two best seasons at third base in franchise history posting OPS+ of 190 in 2013 and 164 in 2012. OPS+ is OPS adjusted for league average and home ballpark. An OPS+ of 100 is average. more than 100 is above average and less than 100 is below average. There is a misconception that a 190 OPS means 90% better than league average. It doesn't quite work that way but 190 is really really good as is 164. We aren't going to count Cabrera though because he has primarily been a first baseman for the Tigers and I only want to include players who played at least half their games at third base. Another rule is that we will only consider games played with the Tigers. So, Eddie Mathews only gets credit for the 9 homeruns he hit in 160 at bats in 1968-1969 and his 503 homeruns with the Braves and Astros will be ignored. Otherwise, he would be an easy choice for the top of the list. Similarly, Travis Fryman's games with the Indians and George Kell's games with the Red Sox never happened as far as this ranking is concerned. Another item is what to do about multi-position players like Fryman who was primarily a third baseman but also played a lot of shortstop. We will take all of his offense at both positions into account, but remove his defense at shortstop to the best of our ability. For more recent players such as Fryman and Brandon Inge, we can also look at measures such as Defensive Runs Saved found at FanGraphs.com. WAR also does not tell necessarily tell us enough about quality or peak value. For example, Brookens makes the top ten according to WAR, but he never had an OPS+ above 98. He also was not an above average fielder. He was basically a utility level player who somehow started a lot of games for some good Tigers teams. Note that, while OWAR does not include fielding performance, it does adjust WAR for the position that a player plays Thus, Fryman gets about three extra wins for his time at shortstop just by being a shortstop which isn't really fair for this exercise. If we remove that, he drops to about 22 WAR which puts him on a level with Kell. Also notice that Nick Castellanos is now #4 once we remove his atrocious fielding. In his case, we actually do have enough information to know that his defense is legitimately poor enough to substantially pull down his WAR (4 WAR versus 14 OWAR)). In fact, it is bad enough that he is no longer a third baseman. Conversely, Inge drops from 19 WAR to 10 OWAR, but we can be confident that he was a strong defender and that will taken into account. Boone (683 games) and Yost (291 games)are now on top, but keep in mind that they accumulated less playing time than Fryman (1,096 games) and Kell (826 games). Longevity and quality both count. 1. George Kell (1946-1952 22.8 WAR 21.2 OWAR) is typically automatically written down as the Tigers top third baseman when people put together a Tigers all-time all-star team (unless they allow Cabrera to be included), but there really is no clear cut winner. Kell and Fryman are very close in terms of offensive career value and the above sources suggest that Fryman may have been a slightly better fielder (although not definitively so). You can make a case for Fryman at #1. You could also make a case for Boone given his superior offense over four years. It is tempting to be a contrarian and not go with Kell, but I think Kell beats Fryman by enough on peak offensive value and Boone in career value to win by a hair. Kell's most memorable season was 1949 when he batted .343/.424/.467 with a 136 OPS+ and 4.8 WAR. He won the batting title that year by .0001 over the legendary Ted Williams. He was trailing going into the final game, but then went 2 for 3 while Williams went 0 for 2 in the finale. He finished in the to ten in the American League in on-base percentage three times and amassed over 4 WAR four times as a Tiger. 2. Travis Fryman (1990-1997 27.5 WAR 24.8 WAR) was an unassuming but steadily above average performer for the Tigers for eight years. His best season was in 1993 when he batted .300/.379/.486 with 133 OPS+ and 5.2 WAR. He also contributed 4.9 WAR in 1992 and 3.9 in 1995. 3. Ray Boone (1953-1958 16.4 WAR 18.2 OWAR) batted .312/.395/.556 in 101 games for the Tigers after being traded from Cleveland in 1953. His 156 OPS+ that year was the best for a Tiger third baseman other than Cabrera. He had three other seasons where he posted an OPS+ of 120 or higher. 4. Brandon Inge (2001-2012 18.6 WAR 10.2 OWAR) had only two seasons with an OPS+ above 100, but was an outstanding defender (70 Defensive Runs Saved at third) and played more games (1,408 including 999 as a third baseman) than any other qualifier. 5. Aurelio Rodriguez (1971-1979 13.2 WAR 4.5 OWAR) was the Brandon Inge of the 1970s, a good field no hit third baseman. He was an even weaker hitter than Inge but also a more elite defender (134 Fielding Runs according to the ESPN Encyclopedia). He was arguably the top defensive third baseman in the league during his prime with one of the best arms the game has ever seen at the hot corner. He played more games at third (1,235) than any other Tiger. 6. Pinky Higgins (1939-1946 11.3 WAR 13.3 OWAR) played 857 games for the Tigers posting a 102 OPS+. Unfortunately, he was a below average fielder (-49 Fielding Runs). 7. Marty McManus (1927-1931 13.2 WAR 12.1 OWAR) posted a 103 OPS+ in 640 games with the Tigers. 8. Ed Yost ( 1959-1960 7.1 WAR 9.2 OWAR) played only two season and was not much of a fielder, but he is second behind Boone with a 127 OPS+ . He led the league in on-base percentage both years. 9. Nick Castellanos (2013-2018 4.2 WAR 13.5 OWAR) has a 111 OPS+ in six years including four full years as a third baseman. He gets penalized for his poor defense (-64 Defensive Runs Saved). 10. Don Wert (1963-1970 10.3 WAR 9.5 OWAR) played eight rather undistinguished seasons with some good teams in the 1960s. He did play over 1,000 games at third base and had a couple of seasons with OPS+ slightly over 100.